Two news items have particularly caught my attention today. 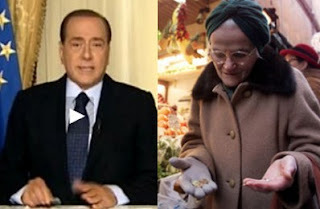 The first is yet another video posted by Silvio Berlusconi to his promoters of freedom, this time focused on the prosecutors which are investigating on him in relation the Ruby case. The second, the last but not the least, is called Noi Italia (We Italy) and is the Istat (most important Italian statistic researchers) report, with aggregate data about our country in the year 2009. Reading the text of the message by our prime minister and giving just a look at the numbers that emerge from Istat research, especially those related to the growing number of poor families and unemployed, I see a further evidence of the shameful short circuit between the prime minister, his paid by the State servants and the real world; the real world that suffers and pays more than all the infamous policy of recent years. There are two Italys: that who attends the spectacle of Bunga Bunga and the one who remains out. It has no money to eat, let alone to pay the ticket. today the Senate and the Chamber of Deputies have confirmed their confidence in the Government and have done so on a sensitive and very important issue for citizens to report to the Minister of Justice Alfano status in Italy. In 2009, families in poverty are on the 10.8 per cent of households, with 7.8 million poor individuals, 13.1 percent of the population. I finally had the opportunity to read the 389 pages of the last real judicial persecution, the twenty-eighth in 17 years, that Milan prosecutor's office notified me with great fanfare and wanted a few days ago. All this could happen to anyone of you. Absolute poverty involves the 4.7 per cent of households, for a total of 3.1 million people. That's why I want to do the job right away, with such conclusive evidence, but judges non-partisan and not with PM who want to use this incident as an instrument of political struggle. These raids against people who were not even investigated, but only witnesses were carried out with utter contempt for the dignity of their person and their privacy. They have been abused, mocked, forced to undress, bodily searched, photographed all his clothes, seized all the money, credit cards, jewelry, phones and computers, were taken to police headquarters, some not even able to call a lawyer and held there from eight in the morning until eight at night without eating and without being able to have any contact with the outside. The inactivity rate of the population between 15 and 64 years amounted to 37.6 per cent, among the highest in Europe. It is particularly high the inactivity female (48.9 percent). The rate of youth unemployment (15-24 years) is equal to 25.4 per cent and higher than the EU average (19.8 percent). I am peaceful, serene, even be you, because the truth always wins. We Italy: ISTAT statistics to understand the country. Berlusconi lashes out at prosecutors in Milan in a new video.